In 1975, three of us started out to find out more about the McDowell heritage. 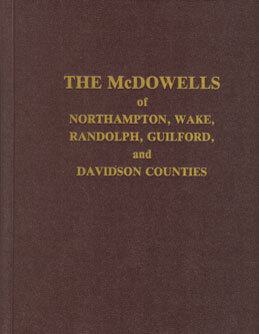 Harding Atlas McDowell and his two sons Keith and Jerry McDowell took on the task of researching the family history. As you recall, the TV documentary "Roots" had just been on and stirred a number of people into looking into their history. In addition, one of our great aunts Mary Leeanna McDowell Lanier had just passed away at age 94 and we had wished we had started earlier. Fortunately, she had a younger sister Chloe Mae McDowell Reid who was still alive at that time and died in 1980 at age 86. She was able to give us many stories and data about our direct ancestors. All of the research was compiled into this book of 230 pages of research text and stories and an additional 30 plus pages of family pictures. Only 100 copies of the hardback printed version shown here were made and none of those remain. However, a softbound version can be made from pdf files of the original. Please email on the link to the left if you are interested in obtaining a copy. We will bind and print them on an individual basis as requested. We hope to have a revised version of the original book with updates some time within the next several years. New information is now available on extended families back into the early 1800s.